News – Page 2152 – Welcome to Wyandotte Daily! Turner High School has increased police presence at the school after a student died from a gunshot wound over the weekend. Sixteen-year-old Kahlif L’ron Hampton, a student at Turner High School, died from injuries he sustained Friday night in the shooting at his townhome residence in the 800 block of North 70th Terrace, according to police. In a news release today, Turner assistant superintendent Jason Dandoy stated that although there are rumors regarding retaliation from this event, police have told Turner officials that there is no credible threat at this time. Turner officials are remaining vigilant as they monitor student activities, he stated, and students are asked to immediately report any concerns to school administrators. Dandoy said Turner High School was able to carry out learning activities as usual. “We will maintain additional police presence through the day and will administer metal detectors for students entering school during the remainder of the week,” he stated. As of Monday afternoon, police said they did not have anyone in custody in connection with the shooting. Police are investigating a homicide overnight in the 4300 block of Farrow Avenue. A police spokesman said officers responded to a report of an armed disturbance at 1:30 a.m. Dec. 16 in the 4300 block of Farrow Lane. While en route, the call was upgraded to a shooting, the spokesman said. On arrival officers found a male in his early 60s outside the residence dead from a gunshot wound, police said. The identity of the victim is being withheld until there is positive identification and family notification. The incident is under investigation by the Kansas City, Kan., Police Department Major Case Unit, which is encouraging anyone with information to call the TIPS hotline at 816-474-TIPS. 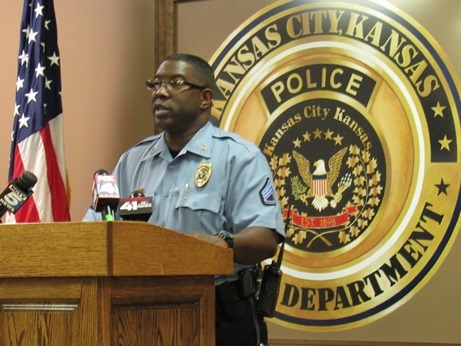 Kansas City, Kan., police today warned the public about a suspect at large in a home invasion case. The suspect is described as a male possibly in his 40s wearing dreadlocks pulled back into a ponytail, who is thought to be about 5-9, police said today. Two cases this morning had a suspect with a similar description, police said. Sgt. Emmett Lockridge said about 9 a.m. Monday, the suspect forced his way into a garage, assaulted and shot a 31-year-old victim in the 2500 block of North 64th Street. The woman fled to a neighbor’s house, where she called police. The victim is now in serious condition at a hospital. The suspect fled in the woman’s vehicle, and the vehicle later was recovered, found burned at 9th and Oakland, police said. There is reason to believe the suspect was at a gas station in the area of 60th and Parallel, and followed the victim home, police said. In another incident at 7 a.m. today at 31st and Eaton, a suspect described as wearing dreadlocks pulled back into a ponytail took a backpack from the victim at gunpoint. This victim was not injured, police said. The 23-year-old woman in this case was being followed by a male, who forced his way into her home. Chief of Detectives Vince Davenport said both victims are traumatized by what happened today. He said he wanted to alert residents to be cautious, and be aware of suspicious activity. He asked anyone who knew of any other incidents today, especially between 7 a.m. and 10 a.m., to call the police department at 573-6020 or the TIPS hotline at 816-474-TIPS. Police have received descriptions of the suspect from the victims and witnesses, he said.